Things vary from season to season and day to day on the farm. Weather changes. Livestock grow. I need help with different chores from time to time. My pigs are my favorite helpers. Julie laughs when I sell the pigs because I act so relieved but within 48 hours I’m racing to buy more pigs. I can explain that several ways. Jordan’s Law of pigs: The relative danger of the pig is directly proportional to the weight of the pig. In some sources of that ancient family text it reads “nuisance” in place of “danger”. Pigs will magically turn garden waste, skim milk, acorns, etc. into bacon while also generating valuable muck. I just like pigs. They are pleasant animals to have around. They make fun noises and it’s fun to watch them explore the world, wondering what everything tastes like, wondering if they can push something over or not. They learn very quickly that we bring the food and we can scratch ears so they seem to want to be near us. Just fun. I am always relieved to sell the pigs because I’m relieved to have successfully SOLD the pigs to customers. Whew! So I like having and selling pigs…and having them again. But that constant stream of pigs on and off of the farm means we change almost overnight from small groups with massive destructive power to small groups with massive cute power. From pigs that generate 25 pounds of manure each day to pigs that weigh 25 pounds each. These two groups have radically different needs and can exert radically different pressures on their environment. And don’t overlook the change of seasons. Seasonality brings its own challenges and each batch of pigs takes 4 months to grow out. Small pigs do better than large pigs in hot weather. No pigs do well outside in wet snow. Care has to be taken when pigs are on pasture in monsoon season or the pasture itself will wash away. And that’s what we’re in now; Monsoon season. But I’m getting ahead of myself. Sometimes we just need the pigs to churn up the ground and add in a big dose of fertility as we did when establishing our garden a few years ago. Our garden is great now. It was initially compacted but a little row-by-row dose of broadfork and a covering of mulch provided all the resolution required. Sometimes we need the pigs to help us compost winter bedding in the cattle barns. 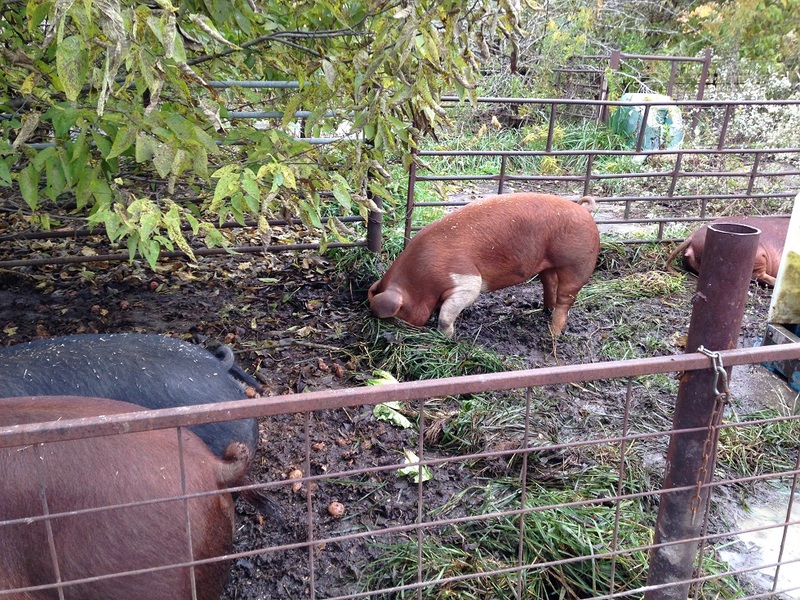 Sometimes we put the pigs on the hillside and ask them to root up rhizomes and eat worms and dig wallows. But I’m tending to drift away from that last one. Keeping livestock is all about enhancing the soil. I have cows because cows help my soil to be healthier. Same with chickens. They cycle minerals through and dispose of vegetation that would otherwise stand and oxidize, shading out future growth. They provide a dose of bacterial activity in the soil to balance out fungal life…maintaining diversity in the soil. Pulsing organic material on the soil by way of trampled organic material, and in the soil by way of decaying root systems of mature plants grazed by the cattle. The movement of the cattle on the landscape enhances both the cattle and the soil over time. 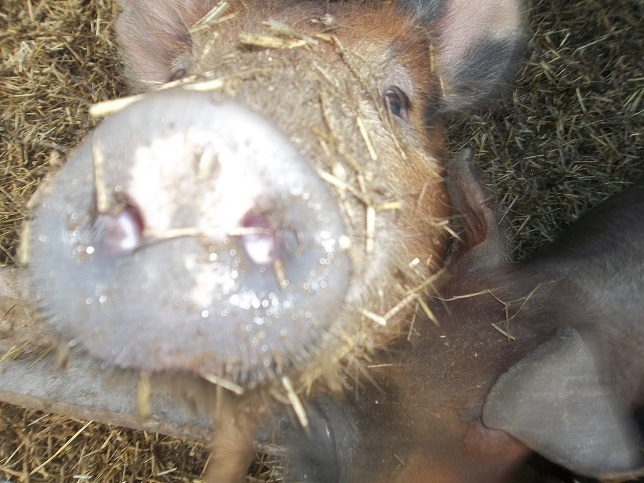 Keeping pigs on pasture needs be the same. I keep pigs on pasture not to have pastured pork to sell but, instead, because it serves in advancing soil health. Throwing pigs on dirt and mud during periods of prolonged rain will cause soil loss and soil compaction. Putting pigs in cold mud will only hurt pig health, whatever customers say they want. The site Natural Pig Farming makes this point well. With this in mind, we use a number of techniques to both respect the pig, build the soil and make our customers happy, just as we vary grazing techniques with cattle. This past year we have offered our hogs access to the nut crop in the forest, deep bedding in barns and, most recently, work reclaiming an overgrown hog lot. 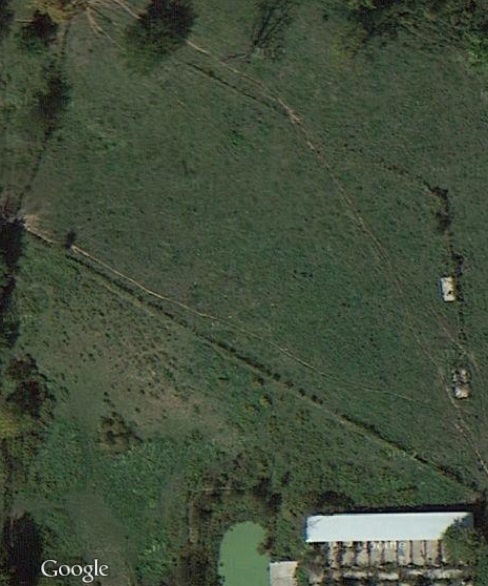 Our hog lot hasn’t been in use for nearly 20 years and has grown into a forest. Most of the bays in the building are being used for storage. I sticker and stack my green lumber from the sawmill in a couple of the bays, we have greenhouse parts and …well, who knows what else out there. Stuff. But the four bays to the west are unused. Because the weather has been cold and rainy for the last two weeks the last place I want pigs is on pasture. They would work up the soil and allow it to wash away. So instead, I’m putting them into the forest with the concrete floor, one bay at a time. Even here they can root and dig and eat grass. I have four pigs in one bay rather than the 60 or so it is designed for. Their job is to reclaim the concrete for me. I filled the sheltered area with straw so they have a comfy bed then leave them to work until the job is done (about a week). Then I come in behind them, shovel and scrape it all clean then compost the manure and bedding under shelter. I have all kinds of reservations about doing this but obviously I think it’s better than putting my pigs out in the cold mud. But it has me wondering what the limits are. Clearly hogs are adaptable animals. 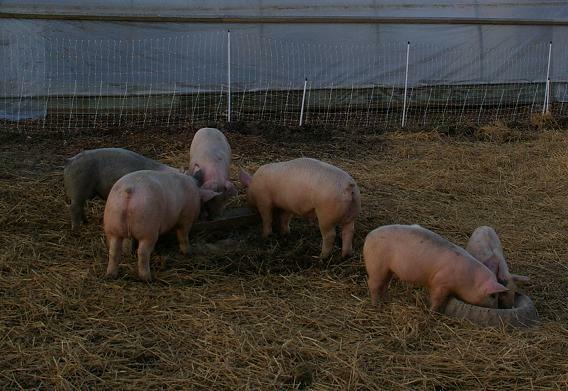 99% of pigs are raised successfully on slatted concrete floors. Heck, Salatin has concrete strips running the length of his hoop structures to keep the pigs from rooting up the ground. He just covers it in a thick layer of deep bedding. And that, to my way of thinking, puts the pig closer to its roots. 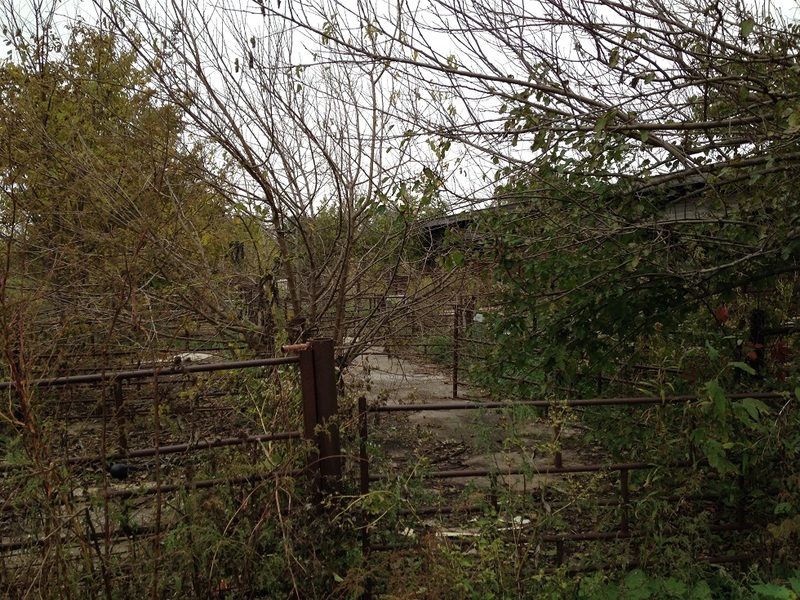 But I’m already somewhat close with the trees growing in my lot. In Dune, Dr. Kynes’ last words were “I am a desert creature!” I think of this when I look at my pigs. They are forest creatures. So how can I go about making room for a forest where none was intended? How can I put deep bedding over a concrete floor that was designed to be scraped clean regularly? Won’t the litter wash out in heavy rain? Won’t it stink if it gets wet? As long as the litter was kept dry, the temperature of the litter-bed was maintained and the odor of the pig farms was controlled. 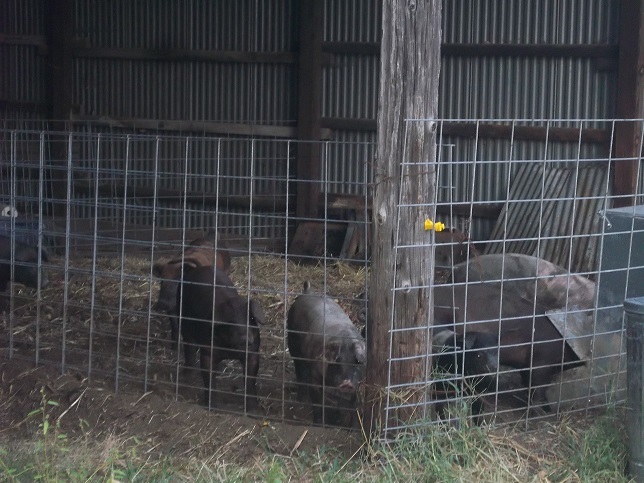 7.6.1 When pigs are excluded from ranging and foraging areas they must be provided with sufficient material they can manipulate so that they can engage in rooting and foraging behavior. They have that right now because of the organic material that has gathered and grown for 20 years. Beyond the goal above, I’m taking steps to keep uncomposted nitrogenous wastes out of our streams. There is a lagoon off of the hog lot. If anything from our four pigs should escape the lot it would have a hard time escaping that. I’m saddled with a hog floor I didn’t ask for. It’s just here because of a decision made by the previous generation. But now that I have it, is there any way I can leverage it? ..even if only seasonally? I think so. But it’s going to take some tinkering. It’s easy to focus on muck and money. But we can’t overlook the forest creature. On the topic of hog floor muck, tune in later this week for The Adventures of Compost Calzone in the Wild West! This entry was posted in Manure, Pastured Pork, Seasonality. Bookmark the permalink. ← How Many Reels of Fence Do I Need? I saw Salatin’s hoop house a while back and we now are sawing strips out of a driveway to plant in. For you that wouldn’t work so well. Can you push the deep bedding into the lagoon to compost there and add more bedding? That would be a greater bedding expense though. I’m looking forward to seeing more of this adventure. There is a concrete shelf below the floor and above the lagoon. I have thought about putting a load of sawdust there to soak up the liquids that come off of the floor. But it looks like it’s built so you can park your manure spreader there and just push the solids off of the floor and into the spreader. I would have to cut down a couple of productive mulberry trees to back anything in there but I like the concept. I don’t think the lagoon is a bad thing but I do want to be careful about what goes in it. I really don’t want to pump out the lagoon and inject liquid manure in my pastures. I would rather keep those liquids suspended in carbon. Others have solved this problem to varying degrees. I just have to learn from their example and try to push forward. I’ve been mulling over these sorts of issues myself, so very timely post for me. I’ve never seen a hog facility like this (not that I’ve seen many), other than the one in American Meat. I guess it’s not dissimilar to the old style English styes, which were brick or stone yards with a shelter at one end. I’m fascinated that you got that kind of tree growth on top of the concrete in just 2 decades. The power of nature, wow. The Natural Pig Farming website is interesting. I didn’t know the method had a name, though I’m aware of at least 3 farmers here on the Island raising pigs this way. I’ve been thinking about this sort of thing a lot, since I don’t have any kind of forest for pigs, and clearly an open field is not an ideal place for them in the heat of the summer. Also, if one wants to raise pigs year round, and someone has to so the rest of us can get a couple of weaners each spring, then how do you do that if you’re not Walter Jefferies on a mountain, but still want them to be able to express “the pigness of the pig”? You may well have the answer by changing it up according to the season, the weather, the circumstances (like composting the cattle’s bedding pack), etc. I think you’ve touched on something here too that I only kind of woke up to this fall after the pigs had gone and I was surveying the paddock I rotated them through. 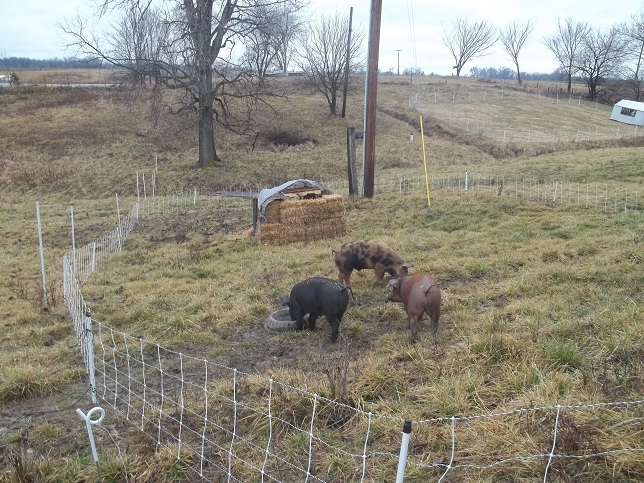 Am I keeping them on pasture because I want pastured pork, or because I am utilizing the pigs to improve the farm? Yeah, good question. I find myself asking one question over and over and over. What problem am I trying to solve? But then there are solutions to real problems that are somewhat less than total solutions. I think pigs on pasture is a great way to get delicious meat on our plate. But does that solution cause other problems? Is that the only way to raise tasty meat? Even if it is, am I doing it the right way? Let’s shift gears here. My broilers are out in the sunshine in their chicken tractors spring and fall. They supplement their diet with clover and bugs and taste great. But they also get wet and cold when it rains. Predators or high winds can wipe out whole crops. Is this better than a confinement house in every way? I’m sure there are chickens that die of heat stroke in confinement houses but only when the cooling systems fail. There are no cooling systems in chicken tractors. Have we found the best possible solution yet? Or do we just need retractable roofs and sprouts and lower stocking densities? What was the problem again? We want to eat humanely raised chicken. But should we be eating chicken? Should we be growing corn and oats and beans and buying tractors and combines and planters and cultivators and trucks and grain bins and grinders and mixers so we can eat chicken? Or should we eat more grass-fed lamb? Our hog floor is called a Cargill Floor. Search engine it up. There’s a shade cloth on the front that can be lowered and windows that open in the back. You can spray mist in the shaded area too. Otherwise the food, water and waste all stay downhill of the sleeping and loafing area. 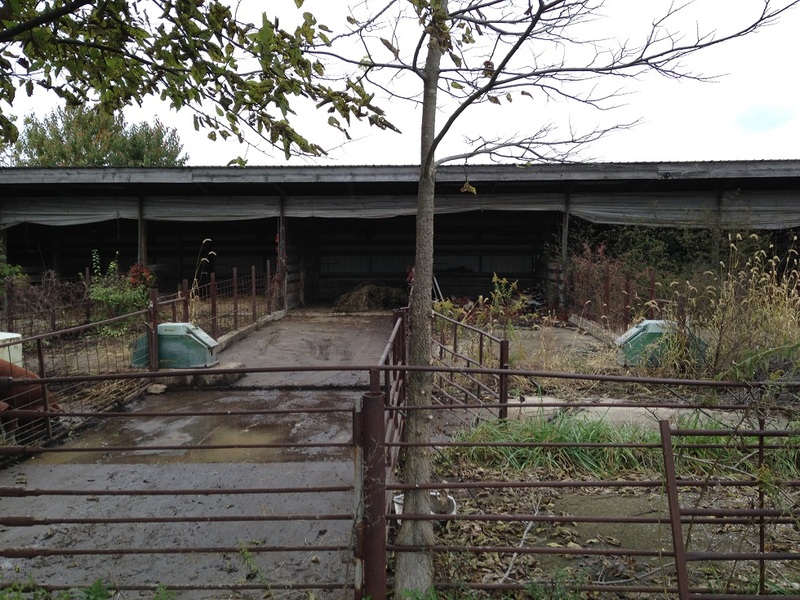 There are gates at the bottom of the slope so you can scrape each stall down to the center, close the gates to keep the pigs out of the way (but still give them access to water) then scrape the whole mess in one motion off of the floor. Pretty slick but not as efficient as putting pigs on slatted floors so you don’t have to scrape anything. But since I happen to have a Cargill floor, how do I adapt it for deep bedding? The few examples I have seen use round bales of corn stover for bedding and it looks like it gets soggy and wet when it rains. I’m in favor of using corn stover. I’m not in favor of wet bedding. What I like about the pictures Walter shares is that his bedding is so deep. The walls of these pens are only 3′ high. Not sure I can do that so I may have to find another use for this building. Good question. Joel Salatin has said more than once that he would rather see birds in a well run conventional barn, clean, dry, access to fresh water and enough room to move around, air circulation etc, than hens stuck in a muddy run with a filthy, dark coop. He says it better, but you know what I mean. I think with your broiler example that you’re right – it’s not a perfect solution. But it is tying in with a previous point you were making, that the birds are serving another purpose by being on the pasture- laying down a quantity of manure. I too am not convinced that these birds are all that happy to be out on pasture. I blame the breed development, but that’s a bit facile. I have layer pullets out in the pasture shelters right now. It’s a completely different scenario – their only complaint with being out there is that the shelters are not nearly big enough for the scope of a young adventurous bird with energy. And roosts, really high up, would be great, please. Again, not a perfect solution, but it’s close. They’re moving indoors next week, and then they’ll be complaining that they don’t have fresh pasture every day. Meat: A Benign Extravagance, Simon Fairlie. It’s very research dense. Don’t start it till you’ve got a good space of time on your hands (haha), or skip a bunch of the in depth stuff and skim the points. The whole book is tackling the question of eating animals that need to eat grain. Whether we should, how much we should, etc. I started to read that book but it has been a few years. I seem to remember one of his arguments being that if the Irish had been allowed or encouraged to keep livestock the potato famine would not have hit them so hard. I’m afraid the book didn’t maintain my interest at the time. Maybe I’ll try again this winter. I don’t remember the Irish thing. If you’re going to graze all of Ireland, make sure you include the racehorse breeding operators in your rotation – some of the best steeplechaser bloodlines come out of Ireland. The potato famine was caused by a heck of a lot more than just potatoes. I read it a few years back, don’t remember details but I’ll probably revisit it one of these days. I googled Cargill floors, didn’t come up with much that looks like yours, though there were some building plans from one of the state university extension offices that looked similar, and someone who had calves in a two run version of yours. And Murphy barns. Which seem to be a version of something I see here in some places. Your set up looks pretty interesting to me. I agree that keeping the deep bed in the runs dry would be the issue. Is it out of the question to put a roof over the runs? How many runs are there? I think there are eleven and a half. You can see it at the bottom of this picture. I will have to make a change to my post. I underestimated what this floor is designed to do. Apparently it is made for 60 pigs per slot. That link gives a pretty good description of it.